In April I bought some colored Easter chocolates on clearance. Blue, pink, yellow and purple. Now I'm trying to find things to make with them. Melt white chocolate and peanut butter together in microwave on medium, stirring several times (took me about 90 seconds total). Melt chocolate chips in same manner. While chocolate chips are melting, spread peanut butter mixture on a foil lined 11x15 inch cookie sheet. 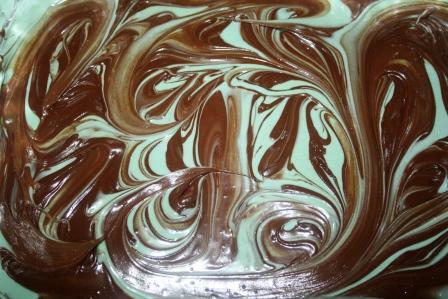 Drizzle melted chocolate chips over peanut butter mixture, and swirl together to create a marble effect. Chill thoroughly, break into pieces. Keep refridgerated. This is from my trusty Baylor Cookbook. I swear, this cookbook has The Best recipes ever. Texans can really cook! You know, you just reminded me that even though my oven is not working, I can make fudge and those no-bake fudge cookies. In all the times that I have bought fudge, I have never tried the Tiger Fudge, I may have to try it out. Looks so pretty and yummy! !